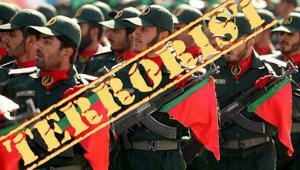 WASHINGTON, DC, USA, April 8, 2019 /EINPresswire.com/ — Organization of Iranian Americans Communities (OIAC) commends the move by the State Department to designate the notorious Islamic Revolutionary Guard Corps (IRGC) as a Foreign Terrorist Organization (FTO). As Secretary of State, Mike Pompeo, said, “This designation is a direct response to an outlaw regime.” Secretary Pompeo added IRGC is gaining its “rightful place” next to all other terror groups sponsored by the regime in Iran. In February 19, 2019, OIAC called the U.S. Sec. 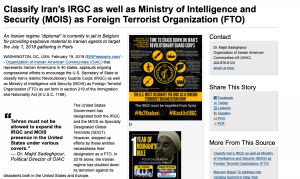 of State “To classify Iran’s Islamic Revolutionary Guards Corps (IRGC) as well as Ministry of Intelligence and Security (MOIS) as Foreign Terrorist Organization (FTO) as set forth in section 219 of the Immigration and Nationality Act (8 U.S.C. 1189)." In December of 2017, in more than 160 cities across Iran, women, youth and people from all walks of life took to the streets calling for freedom and democracy. These protests continue to this day. OIAC believes democracy and human rights in Iran are imperative to the national security of America and peace in the Middle East and beyond. With this move, the IRGC can no longer operate without impunity and the people of Iran are further empowered in their quest for freedom and democracy. We reiterate our demand and urge the State Department to designate Iran's Ministry of Intelligence and Security (MOIS) as a Foreign Terrorist Organization (FTO). Next Next post: நாடுகடந்த தமிழீழ அரசாங்கத்தின் தேர்தல் வேட்பாளர்களது மனுத்தாக்கல் நிறைவுபெற்றது: தேர்தல் ஏப்ரல் 27.